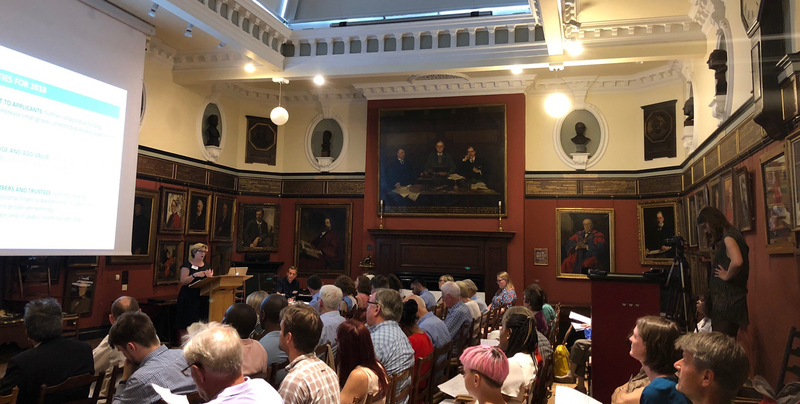 London Catalyst held its AGM on one of the hottest days of the year, in a new venue, with three speakers, a new format and the promise of ‘the best sandwiches in London’. A lot to look forward to. Maggie our Chair of Trustees opened proceedings, welcoming guests to the wood-panelled Georgian splendour of the Art Worker’s Guild, and thanked our members and donors who have supported the charity during the year. 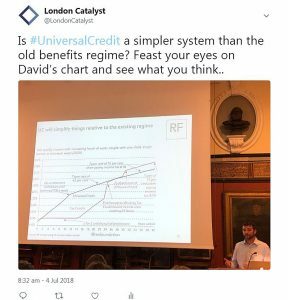 David Finch, Senior Research Fellow at the Resolution Foundation, was our keynote speaker on the topic of Universal Credit (click to view his PowerPoint presentation as PDF). 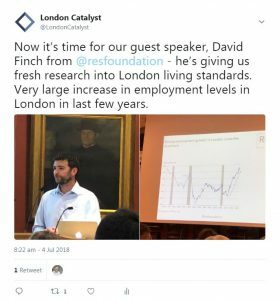 David opened with findings from a recent study on London’s living standards. The Resolution Foundation have reported that there has been a very large increase in employment levels in London in the last few years. But strong employment figures mask rising inequalities. Despite the big growth in unemployment, insecure work is still prominent. Wages in London have been squeezed by -7.3% and it is all due to the increase in employment. New Londoners are doing new jobs, which are low paid. This set the theme of the day. 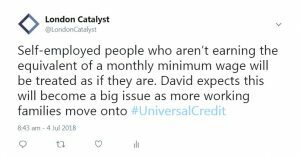 Universal Credit (UC) is replacing existing working-age benefits; it’s designed to simplify the system and incentivise work. However, the original model has been scaled back and is less generous than envisaged. David stated that working families and single-parent families are set to lose out. He also remarked that “if things don’t change, we are expecting the biggest increase in inequality since the 1980s”. Does UC reflect the reality of people’s lives? David observed that problems begin when the UC encounters the reality of how people live. It’s difficult for some people to manage with a single monthly payment, being paid one month in arrears, and waiting weeks for their first payment. Childcare costs must be paid up-front then claimed back afterwards. Self-employed people may struggle. UC was originally intended to be fully rolled out by 2018. It is now expected in 2023. The reform might be good in theory, but it is hugely problematic in practice. Fundamental to this is a loss of trust in the system because of payment delays and practical problems that have caused real hardship. In conclusion, the Resolution Foundation recommend fixing UC; advocating improving incentives for second earners by introducing a new work allowance, encouraging progression at work, restoring the generosity of the original model and in the longer-term, lowering the taper rate and increasing childcare support. It was interesting to hear David’s analysis although the impression remained of a system dogmatically and structurally antagonistic to the lives of many of the poorest and disadvantaged in society. Helen jointly manages Hackney Migrant Centre, one of the many frontline organisations across London that have received a Samaritan grant from us. 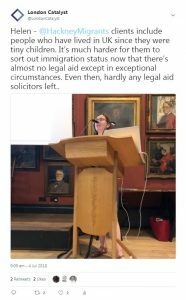 She spoke from the heart about people with “no recourse to public funds” (NRPF) and cuts to legal aid. Many people who have lived legally in the UK for years, have contributed and have children, find themselves caught in a relentless, fee-driven bureaucratic cycle. “The pressure on services like ours is immense” said Helen as she offered a sobering account of the hoops migrants must jump through and the financial and legal hurdles they face in the continuing ‘hostile environment’. Alison (our Grants Administrator) shared findings from our recent survey of grantees on their service users’ experiences of UC. We heard that the long delay in receiving the first UC payment has left people with no food to eat, rent arrears, being threatened with eviction, and getting into debt to cover every-day living costs. Monthly payments causing challenges for those unused to budgeting. Claimants with health and medical conditions should be accompanied at any assessment meeting. We learnt from David that the UC model may be theoretically sound but is struggling to adapt to how people live. Helen eloquently described the plight of those excluded from social welfare support and Alison revealed the unintended consequences of a system failing to deliver. The speakers offered food for thought, the venue proved popular, the debate was positive and passionate. And in a straw poll of volunteers one thing was certain: the sandwiches were indeed the best in London.